You are here: Home / dinner / Thanksgiving Sandwiches! Be grateful all over again with this easy recipe for Thanksgiving sandwiches. Put all of those turkey leftovers to delicious work! I know, I know, it’s not even The Day and I’m already dreaming about the leftovers. And by leftovers, I mean this perfect, perfect Thanksgiving sandwich…thick slices of leftover turkey nestled between generous spoonfuls of stuffing and cranberry sauce, with a nice puddle of gravy. All served up on a soft roll, and now you are dreaming about leftovers too, right? And while it might not seem like a recipe is needed for a turkey sandwich, in my experience it’s all about how you put it together. So, once the turkey is carved and the mashed potatoes are eaten and the pumpkin pie is sliced and you are once again hungry even though you swore you would never be hungry again, come on back to Framed Cooks and let’s make it!The first thing you need to remember is to pick up some nice soft rolls when you are out doing that Thanksgiving shopping. I like the rolls pictured above, but in a pinch hamburger rolls will do just fine. A soft roll is key to the deliciousness here. 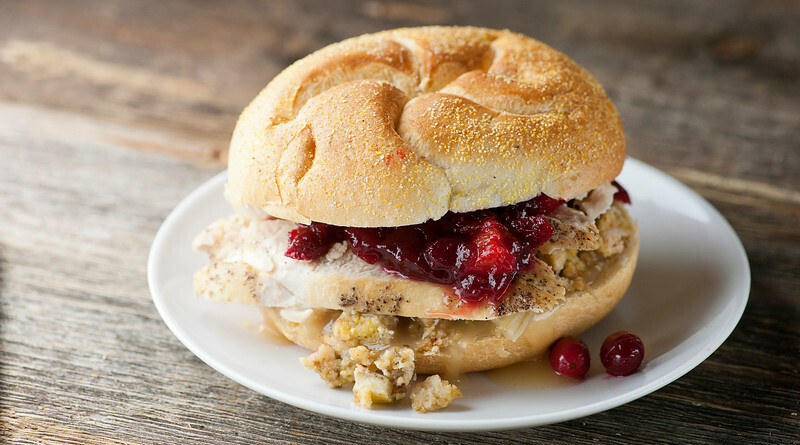 Now assemble your sandwich fillings: sliced turkey, cranberry sauce, stuffing and a little leftover gravy. You also need a little chicken broth. The stuffing and the gravy can get heated up quickly in the microwave, but you don’t want to heat the turkey that way because it will cook it into dryness (the horror!). Nope, heat about 1/2 cup of broth over medium low and slowly heat the turkey until it is just warmed. Now the Vey Important Assembly. If you have hamburger rolls you can start right in with the assembly. If you have bigger rolls like the ones I used, you want to pull a little bit of the inside of the roll out, just to give a little bit more room for the fillings. Start by spooning the gravy onto the bottom half of the bun. Now press some stuffing on top of the gravy, and then drizzle a little more gravy on top of the stuffing to hold it in place. Layer a slice or two of turkey on top, and top the turkey with a generous spoonful of cranberry sauce. Pop the top of the roll on top. And there you have it. Thanksgiving Sandwich Perfection. And with that, Framed Cooks is going to take a little break to make mashed potatoes and watch football and eat turkey and pumpkin pie and count my many, many blessings…including you, my wonderful readers. Love to you, and hope your Thanksgiving is delicious and joyful in all the best ways! Heat the broth in a small skillet over medium low heat. Add turkey slices and simmer until heated through, about 3-5 minutes. Meanwhile, heat the stuffing and gravy in the microwave until heated, about a minute or two. If you have larger sized rolls, tear out some of the insides to make room for the filling. Start by spreading almost all of the gravy on the bottom half of the roll. Top with stuffing and drizzle the remaining gravy on top. Press down gently. Lay the turkey slices on top of the stuffing. Top the turkey with the cranberry sauce, and top with the top of the roll. Take a big bite and have a napkin handy. Feel very grateful. The killer turkey sandwich a few hours after the big meal is my favorite part of Thanksgiving Kate! I’m already dreaming about it! Yours looks fab! Hope you have a wonderful holiday! I hope you have a wonderful Thanksgiving! Thanks so much for sharing my pumpkin pie – I hope you enjoy it! I love Thanksgiving for the leftovers! Especially when sandwiches are involved. This looks wonderful, Kate! I wish I had this for breakfast right about now! Thanksgiving for breakfast – love it! Thanksgiving leftovers are the best! Not only do you not need to cook again, but the combination is spectacular. This is definitely my kind of sandwich! I’ll be making this one of Friday, for certain! Aren’t they? Almost better than the main course! Heh, I think I spend the better part of my day thinking about what I’m going to do with my leftovers. Thanksgiving is the BEST for leftovers, and I’m sharing this recipe with my cousins who love love love the extra turkey! Perfect match for Thanksgiving!!! Thanks s much for sharing this, Kate! The taste of turkey, gravy, chicken broth, cranberry sauce and rolls altogether. It is out of the world! It IS! One of my favorite combos. Although I can buy chicken sandwiches easily right on the streets because it is a common food all over the world. But, your recipe makes me get a tip to prepare the turkey sandwiches perfect! I mean you have created the sandwiches that no one can deny because itis too attrative! The focal point of this, I think, is in the cranberry sauce. Great tip! Thanks for sharing!